If the number one thing on your mind is “going number two” to cure your digestive woes, then this miracle fruit may be just what you’re looking for. Having regular bowel movements is an essential component to a healthy, functioning digestive system, as it allows the body to detoxify itself. However, the dreaded thought for some of being constipated again or struggling with an irritable bowel, is enough to drive anyone mad. Bran cereals, prunes, dissolvable fiber beverages, laxatives, medications and avoidance of certain foods, are just some of the efforts made in hopes that your uncooperative, sluggish system will respond to something already! Papaya contains a powerhouse enzyme called papain. This wondrous enzyme stimulates digestion by actively breaking down protein, more specifically, the bonds between amino acids (the building blocks of proteins). Additionally, it’s chockful of vitamin C, with one cup of mashed papaya providing 147% of the daily value. It's a fantastic food source high in antioxidant content and anti-inflammatory properties, fighting the common cold/flu and aiding those suffering from asthma and arthritis. Its high water and fiber content, helps with elimination of toxins and obtains cancer-fighting benefits due to its ability of combatting free radicals. Now talk about a miracle worker! How does it relieve digestive ailments? Digging your teeth into some sliced papaya is a great way to remedy intestinal ailments such as constipation, bloating and irritable bowel syndrome (IBS), as it promotes a healthy gut and provides digestive support. In fact, its native South American producers commonly use it as a meat tenderizer for its effectiveness in breaking down protein, carbohydrates and fats. DO THIS – for an extra digestive boost, buy green papaya as it has a higher concentration of papain. However, it will not taste as sweet as it's riper counterpart! One of the most bothersome side effects of being "backed up" or consuming gassy/sodium-dense foods is that feeling of fullness, pressure and billowing around the belly; it’s enough to scream out in agony. However, the fiber and anti-inflammatory properties found in papaya can help in the elimination process, thereby reducing bloat and supporting a strong digestive tract. 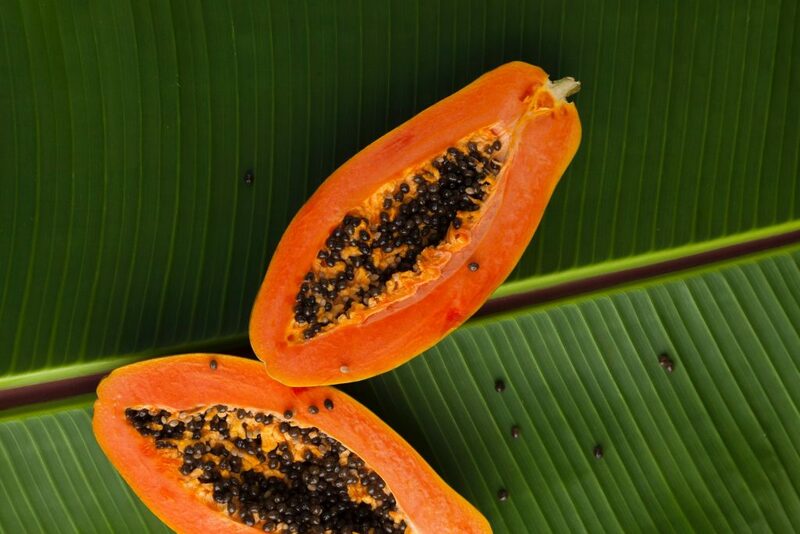 DO THIS – Eat papaya whole or blended into a smoothie to ease your bloated tummy. We’ve all experienced the nagging, burning feeling (and indigestion that ensues) from enjoying acid-invoking foods and/or beverages. Over-the-counter solutions often seem like a placebo with no lasting effect to combat the relentless acid bubbling and churning. However, papain and chyomopapain are both powerful enzymes in papaya that can assist breaking down proteins to soothe the stomach by supporting a healthy acidic environment. DO THIS – Munch on a few pieces to avoid acid reflux or help dissipate acid indigestion. Papaya can help to remedy your digestive shortcomings! With its powerful, healthful properties, this delightful treat can tame an upset, swollen belly and turn your sluggish digestive system into a tranquil, gut-friendly environment. Papa-YA! Daniela is a fitness and extreme sports enthusiast, food adventurist, coach, lifestyle model and writer. She aims to inspire positive change and writes articles on fitness, health, lifestyle and personal development at Dee-Vita Reflections. What you don’t read can hurt you.